This is our most active and visual party with big machines, balloons and lots and lots of group interaction. 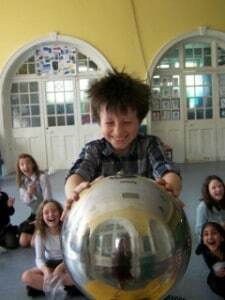 The highlight of this session is the Van de Graaff generator which is the machine we use to make people’s hair stick up as well as making lightning – all using static electricity! We will also be using flashing circuit balls to become a circuit ourselves and learning about conductors, insulators and switches. There will also be a few competitions too, including a crazy hair competition! At the end children will be given their own science name on a certificate to take home. This party lasts for around 60 minutes and is recommended for children aged 6-11. The price quoted is for 20 children but extra children can be added at just £2.50 each. “‘The other mums and I were very pleased with the Fun Science party. We were amazed at the way that the unruly mob of youngsters were held enthralled by the science “lesson”, and certainly picked up lots of new knowledge as well as having lots of fun with their hair on end! Thanks for a fabulous afternoon, and especially for being so flexible around our time and date changes.’” – A testimonial from a parent booking an Amazing Electrics party in Bristol. Got an enquiry or want to find out more? Email cheshire@fun-science.org.uk or call 07736 231794. Looking for something more explosive? Click here for more party packages.